Who doesn’t like a pizza? I think it is almost impossible to find somebody who does not like pizza. And this gluten-free low carb eggplant pizza is a great pizza option for people who follow a gluten-free diet. This eggplant pizza is 100% bread free. Eggplant slices made a perfect eggplant pizza crust. This low carb snack is an easy food to make at home and this gluten free homemade pizza recipe is extremely tasty. Wash the eggplant, wipe it and slice it. Keeping a thickness of a ½ inch, slice the eggplant. The slices will become the eggplant pizza crust. Place these slices on a kitchen towel. Sprinkle some salt on each slice (both sides) and let them rest for 30 minutes. 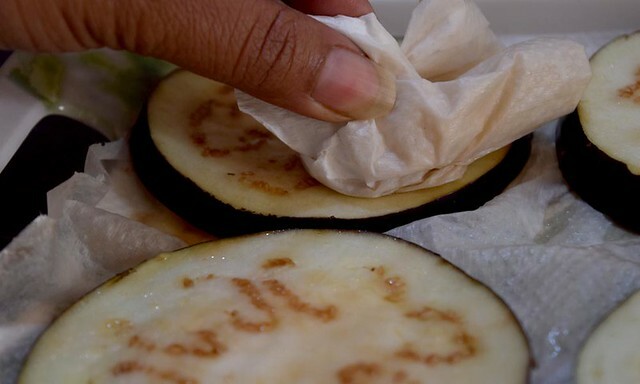 The salt will help to extract the water (excess moisture) from the eggplant slices. In a pan take 2 tbs olive oil and add chopped garlic to it. Add 1 cup of finely chopped, deseeded tomatoes, salt, sugar, mixed herbs, and seasoning. Now add 2 tbs of tomato puree. Cover the pan with a lid and let it cook on low flame for about 10 minutes. After 10 minutes, remove the lid and blend the prepared sauce. Let us go back to our eggplant now. After 30 minutes, you will notice that the eggplants have released the water. Using another paper towel, wipe the excess water. Keep the oven for preheating to 200 °C. 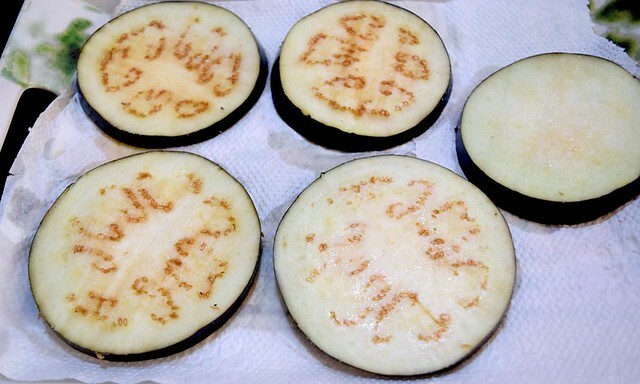 Arrange these eggplant slices on a greased baking tray. Brush each slice with olive oil. Bake them in a preheated oven at 200 °C for 15 minutes. After 15 minutes, take the tray out from the oven. 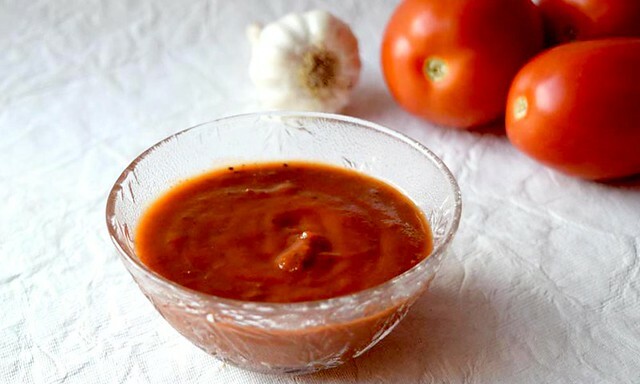 Spread homemade pizza sauce on each slice and top it with cheese. Broil (only top coil) these pizza slices for 5 minutes at 200 °C. Your gluten free low carb eggplant pizza is ready to grab. Love Pizza but avoiding it because of the calories that it adds to your body. 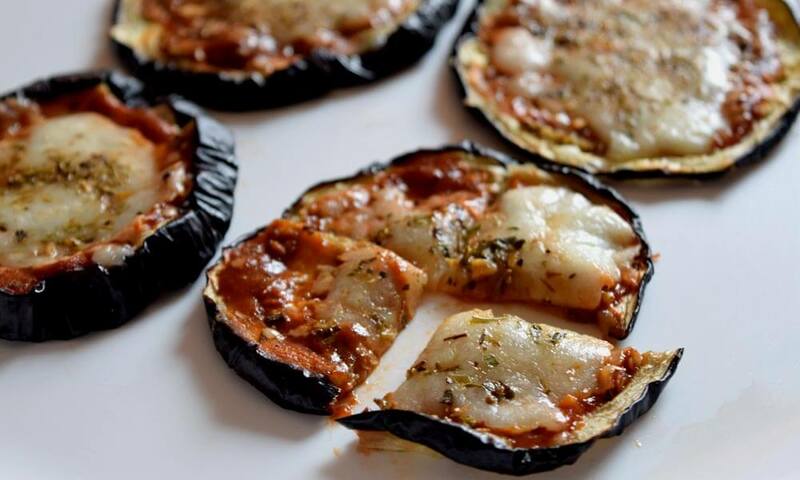 How about trying these amazing low carb eggplant pizza. 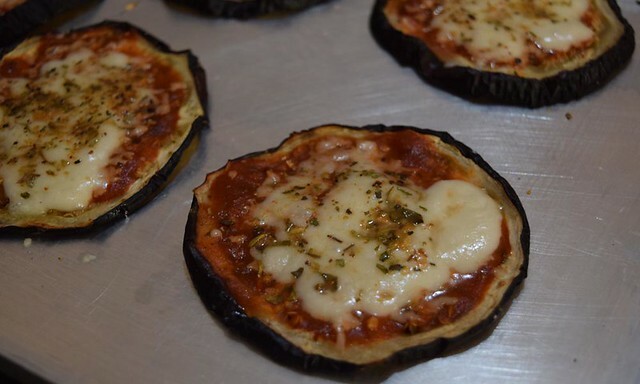 These eggplant pizzas are easy to make gluten-free pizza for people following a gluten-free diet. Wash the eggplant, wipe it and slice it. Keeping a thickness of ½ inch, slice the eggplant. Meanwhile, In a pan take 2 tbs olive oil and add chopped garlic to it. Add 1 cup of finely chopped, deseeded tomatoes, salt, sugar, miexed herbs, and seasoning. Add 2 tbs of tomato puree. Cover the pan with lid and let it cook on low fame for about 10 minutes. Pizza sauce is ready. Let it cool down. Keep the oven for preheating at 200 °C. After 30 minutes, you will notice that the eggplants has released the water. Using another paper towel, wipe the excess water. 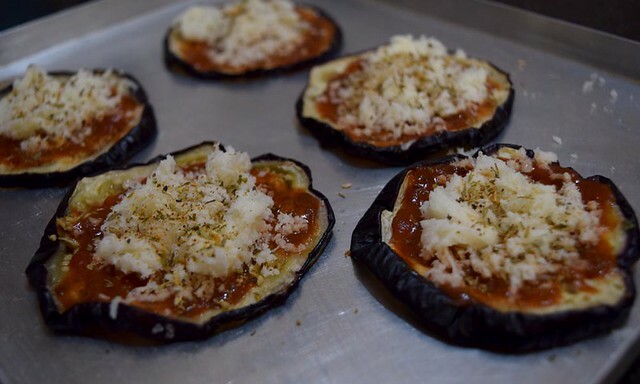 Arrange the eggplant slices on a greased baking tray. Brush each slice with olive oil. Bake them in a preheated oven at 200 °C for 15 minutes. After 15 minutes, take the tray out from oven. Spread homemade pizza sauce on each slice and top it with cheese. Choose big size eggplants for this recipe. Do not slice the eggplant too thin. 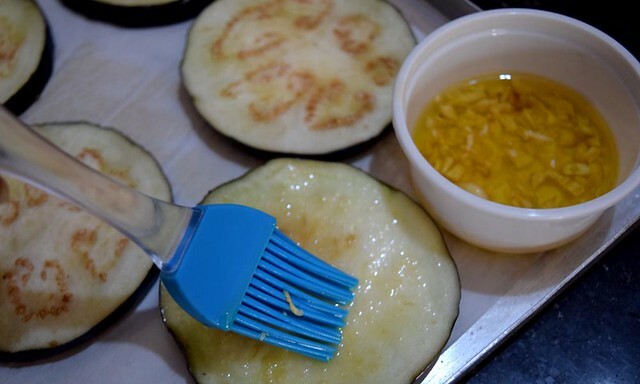 You can brush the eggplant slices with regular oil/butter as well before baking. You can add your choice of toppings.